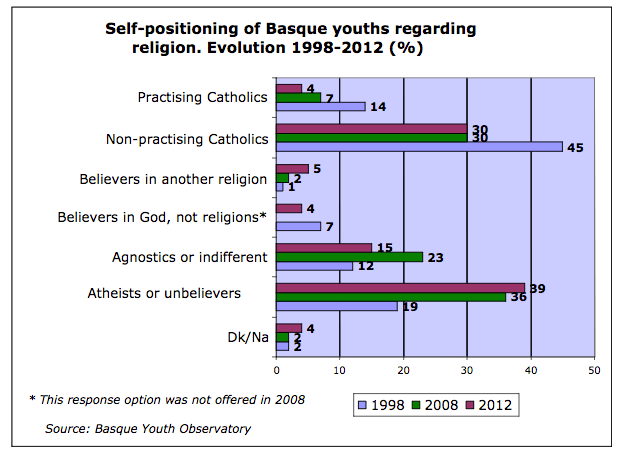 Above is a graph from a recent study done by the Basque Youth Observatory (visit this link for the full study). This study is based on responses of young people between age 15 and 29. Today would you pray for the 4% of students who believe in God, but not religion? I believe that these students are open to God, possibly the Bible, and a new expression of what it means to be Basque AND follow Jesus. It’s a small number, but maybe these group of young people can bring about a big change in the Basque Country.